The Western Cape Government and the City of Cape Town recently unveiled a bronze statue at City Hall to honour former president Nelson Mandela. The newly-unveiled statue undoubtedly adds overall to Cape Town’s rich heritage but most specifically to that of the Central City. Positioned on the balcony where Mandela stood when he gave his first address as a free man on 11 February 1990, the statue is meant to serve as a constant reminder of that historical day and the many years of sacrifice that led to the moment when he was freed. According to the director of the Cape Town Heritage Trust, Laura Robinson, the statue represents an important moment in celebrating our history and is a gesture that will surely help unite Cape Town’s citizens. The Cape Town Heritage Trust, based in The Company’s Garden, is tasked with the promotion and protection of both the cultural and natural environments of Cape Town. Says Laura: “It is so important to remember and honour our true icons and Nelson Mandela is one of South Africa’s and the world’s most loved and respected figures. The statue will also offer a fabulous opportunity for people to take their photographs next to the image of our beloved Madiba.” Created by artists Xhanti Mpakama and Barry Jackson, Madiba’s statue stands at 1.95 metres tall and weighs 120 kilograms. The likeness of Mandela wears a grey suit identical to the one he wore on the day of his release from prison. His accessories, including a polka-dot print tie, belt buckle and a white pocket square are included as details. In his hand, he holds a page bearing the first paragraph from his speech, with the text also featured in braille on the page. Another fascinating feature about the statue is that Madiba is holding a pair of spectacles in his hand. On the day that the image portrays, Madiba had left his glasses in the car that carried him from Victor Verster Prison and he thus borrowed a pair from anti-apartheid activist, politician and his late ex-wife, Winnie Madikizela-Mandela. In photographs from the day, he is seen wearing the large frames. So as not to detract from his facial features, but to retain historical accuracy, the artists have placed the spectacles in his hand. Commenting on the importance of preserving and celebrating our heritage, Laura explains that heritage is a reminder of our shared past, both good and bad: “In the South African context, it has contributed to who we are as a nation today and even if we may not always like what has gone before, we need to learn some valuable lessons from our shared history so that we don’t make the same mistakes again. Our heritage contributes to our feeling of identity and community and is a valuable tool in building communities and bringing people together. Founding director of Culture Connect SA, South Africa’s only art and design tour specialist offering both public and private tours, Kate Crane Briggs shares Laura’s sentiments adding: “Cape Town’s heritage shows the city’s rich, diverse, long and unique history and it helps to tell stories about its people. Both Laura and Kate believe that as people who live, work and visit the Central City, we are fortunate that there is so much heritage around us every day. Kate adds: “Walking is the best way to experience the diverse heritage and history in the Central City. You can see artist Roderick Sauls’ apartheid-era benches outside the High Court Annex on Queen Victoria Street, Ruth Sacks’s Cissie Gool Memorial on Longmarket Street and Conrad Botes’s The Purple Shall Govern on Church and Burg Streets commemorating the End Conscription Campaign’s commandeering the police’s dye spraying. Dating back to the 1650s, this is the oldest garden in the country. 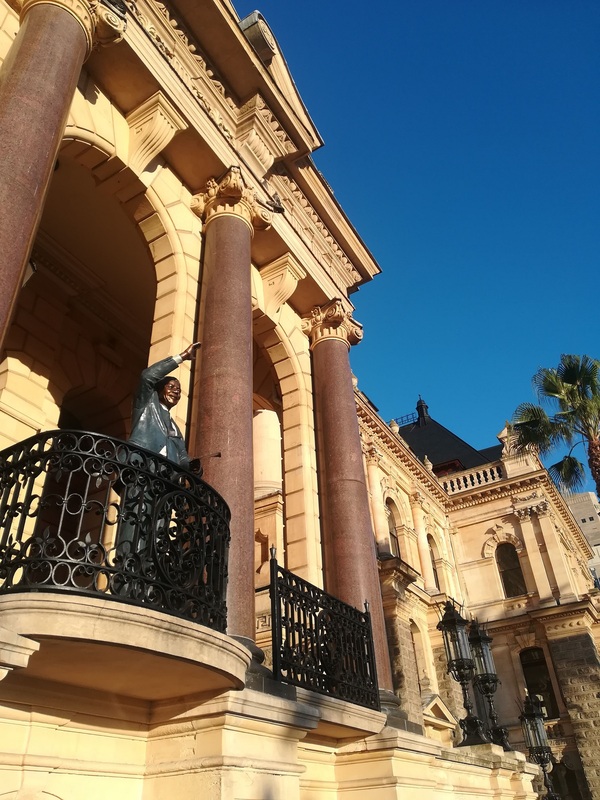 Standing tall and proud for 113 years, City Hall has been refurbished and will soon house an important permanent Madiba exhibition, as well as once again be home to Sunday night concerts of the Cape Philharmonic Orchestra. Once destined to be a parking garage, the square was restored by the Cape Town Heritage Trust and Shortmarket Properties in the 1990s and is well worth a visit. See also number 6. The church has a long association with slavery and is also a fine building in its own architectural right. The artistic interpretation memorialises the impact of slavery and has information about the names and origins of slaves who were brought to Cape Town. This ancient plant dates back several hundred years and still bears grapes. It is thought to be a cultivar similar to that of the current Chenin Blanc. Noteworthy as a world-renown Art Deco building, this was South Africa’s first skyscraper and its façade boasts one of the longest craved stone friezes in the world as well as nine gigantic carved granite figures representing African tribes. Grand CentralThe former main post office is a reminder of how important the mail ship and post were, and the murals tell the old nationalist story of Cape Town. Now part of the South African Jewish Museum, the Gardens Shul has wonderful displays and its small portico is Art Deco Egyptian and can be seen from The Company’s Garden. This is a good reminder about water being so precious and why Cape Town developed in the first place. These are among the most beautiful burglar bars in town and a lovely way to enter this renovated heritage building full of interesting and important work. A CBD sound rather than a site, the Noon Day Gun is fired from Signal Hill over the Central City every day except Sundays and is a great reminder of Cape Town’s maritime heritage that continues to this day. The details on the exterior of this building are beautiful and the public space outside is used for praying as well. This article was first published in the 2018 spring issue of the CCID’s quarterly publication, City Views.